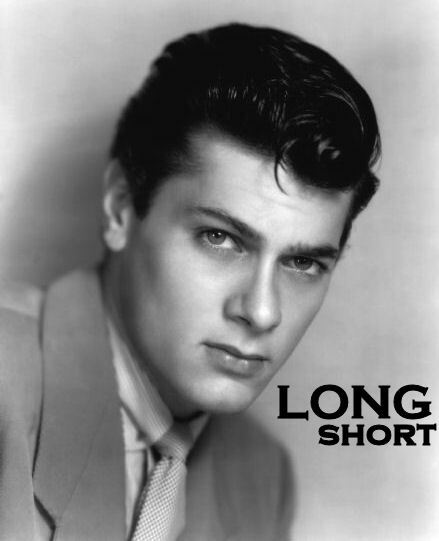 Our hearts go out to the friends and family of actor Tony Curtis, who died in his Las Vegas area home yesterday. Mr. Curtis was 85. In addition to his wife, Jill VandenBerg, Mr. Curtis is survived by Kelly Lee Curtis and actress Jamie Lee Curtis, his two daughters with Janet Leigh; Alexandra Curtis and Allegra Curtis, his two daughters with Christine Kaufmann; and a son, Benjamin Curtis, with Leslie Allen. 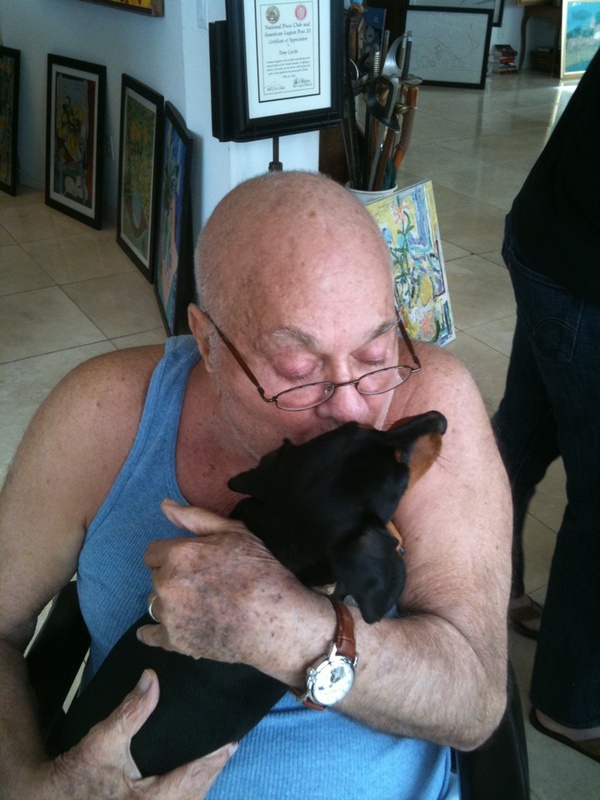 He is also survived by his lovable black and tan smooth Dachshund, 'Bronx.' Thanks for the memories Mr. Curtis. The design and the story that goes along with it originates with one of the brewery’s earlier owners, John Geyer. 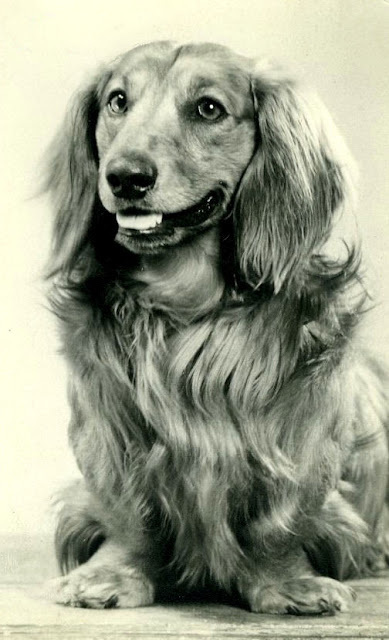 As brewery legend would have it, Geyer owned a brood of purebred Dachshunds and used the image of Frankie, his top dog, in ads, signs and packaging for the locally-brewed beer. 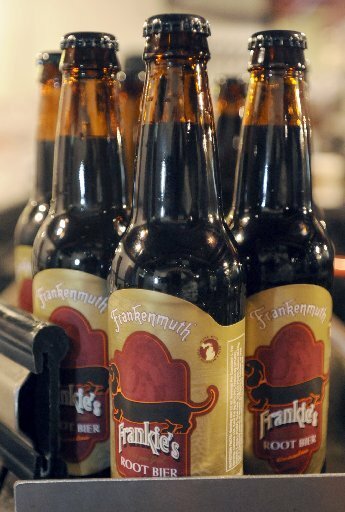 There are a few items with Dachshunds on them available online at the Frankenmuth Brewery. We love to collect vintage Frankenmuth memorabilia and have featured some of the gems in the archives. Check 'em out! We can't thank our MidWest Dachshund Rescue friend Alison enough for surprising your Long and Short of it All host 'Joey' with this new bed to help in his recovery after surgery. He LOVES it. Joey was so excited when Dad removed it from the packaging, and it complements his piebaldism perfectly. He rolled around in it immediately, tail wagging at full speed. "It's a big giant ME!," he must have thought. Alison made this herself! Joey continues to recover well after his long ordeal. He's still getting adjusted on his medications for Addison's Disease. The daily prednisone he takes is causing him to drink and pee a lot, but we're hoping to reduce his dose some to alleviate this. He had electrolytes drawn last Saturday to check and make sure they are OK, as his monthly DOCP injections control them. They are looking good, but he is probably going to need a dose reduction of his DOCP as well. Otherwise, he is a happy, hungry, and active little guy. We're so thankful. UPDATE 12 NOON: Thanks to ISewNBake for leaving a comment: Alison has some on ebay right now and she regularly donates them to MWDR for raffles. Here is the link to the 2 she's got for sale right now: eBay. Hurry up, they are Buy It Now! Sweet photo included with Joey's bed. 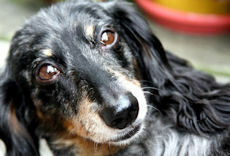 In the "hope" department, it's a sad day when your Dachshund is stolen, but a happy one when she is found. That's what happened to these one and three year-old girls who hail from Newington Close, Southend, UK. Their cute Dachshund puppy 'Rolo' was stolen from inside their home last Saturday evening. Their Mom received an anonymous tip where the puppy could be found, and it was right around the corner from them! After the police refused to help get the puppy back, stating that "it wasn't a priority," a family friend knocked on the door of the house and stated "I believe you have my neighbour’s dog and I would like to take her back to them." Read all about it at Echo News. And in the dreaded "despair" department, our hearts go out to the family and friends of 3-year-old 'Minnie,' seen here, who passed on Monday while undergoing a routine teeth cleaning at Banfield Pet Hospital in Cape Coral, Florida. 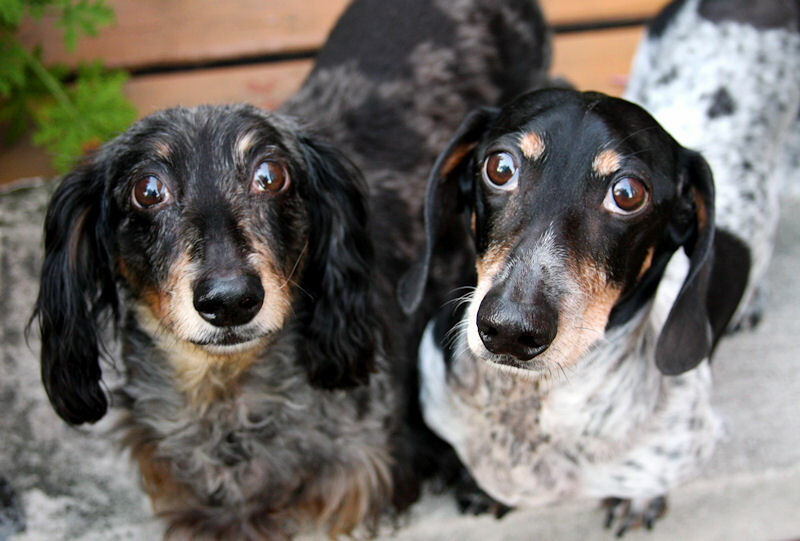 It's every Dachshund and dog lover's worst nightmare that something might happen from anesthesia during a teeth cleaning, and sometimes it does. Rest in Peace little girl. You were loved. Read more at the News-Press. Read all about the calendar project and see more photos at The Miami Herald. 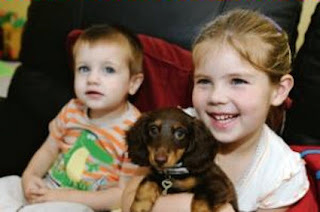 'Dexter,' a 7-year-old Dachshund owned by John and Mindy McFarland of Newtown, Connecticut, was born without eyes due to a genetic disorder — but his sense of smell is keen. 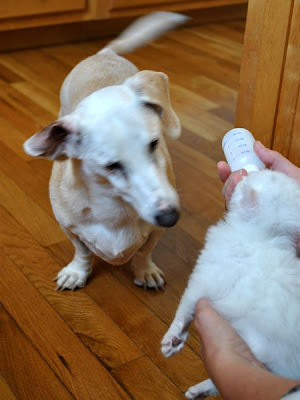 Here, Dexter shows great concern for 'Smudge,' the month-old kitten that has come into foster care at the McFarland home, as the kitten receives a bottle of formula. The McFarland household is full of special needs animals who need lots of love and care. "Dexter will sit in front of the crate and jump up and down, hoping we will take the kittens out," said Ms McFarland. "He loves to lick them, and has this motherly streak in him," she said. Read all about this special household and see more photos at The Newtown Bee. 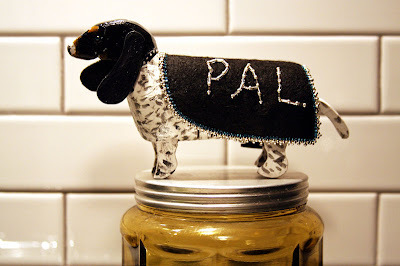 Grab a cup of coffee, put a Dachshund on your lap, and enjoy this newest video by one of our favorite youtubers, Verysupercool, who note: Central Texas Dachshund Rescue rescues, rehabilitates and re-homes dachshunds in need. 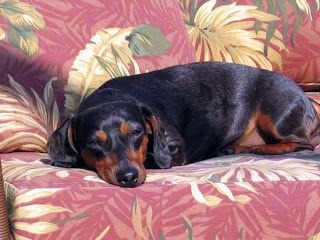 This video shows all the rescue dogs that are featured in the 2011 Central Texas Dachshund Calendar. These dogs had a "ruff" start but were given a second chance to have a great life thanks to CTDR. You can order your calendar now at CTDR. Diving Dachshund (Martin) is CRAZY about Swimming! Sydney Savage, 9, is assisted by her mother Stacey Savage after falling over Saturday when 'Weenie,' her aunt Gloria Kost's Dachshund, leaped forward prior to the beginning of the “Running of the Wieners” during the Beardstown Fall Fun Festival in Beardstown, Illinois. Weenie is a real go-getter! Forty-three dogs raced to raise $304 to go toward the Dog Pen, a local no-kill animal shelter. Way to go! Source. Vintage hoto circa 1966, source unknown. 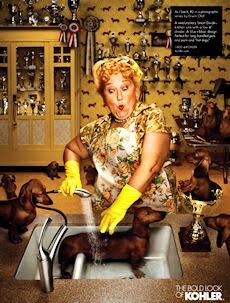 Well, aren't you proud of your Dachshund? Vintage 1950's photo source unknown. 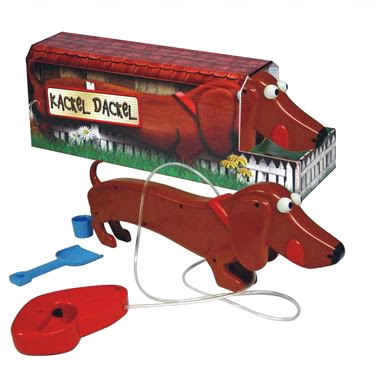 Thanks to Carla Herzog for leaving the link to this video in the comments on Shopping For Dachshunds: Kackel Dackel. Apparenlty in Maintal, Germany, Kackel Dackel games were recently given out to folks who showed up to demonstrate the proper way to dispose of dog waste. Kudos to the makers of this game. And an anonymous person just posted the link to this promo. Thanks! 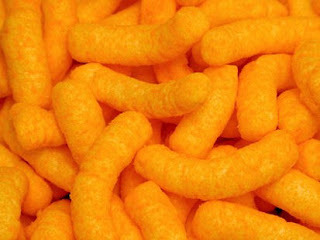 We may never eat Cheetos Puffs again. Oh, who are we kidding, yes we will. 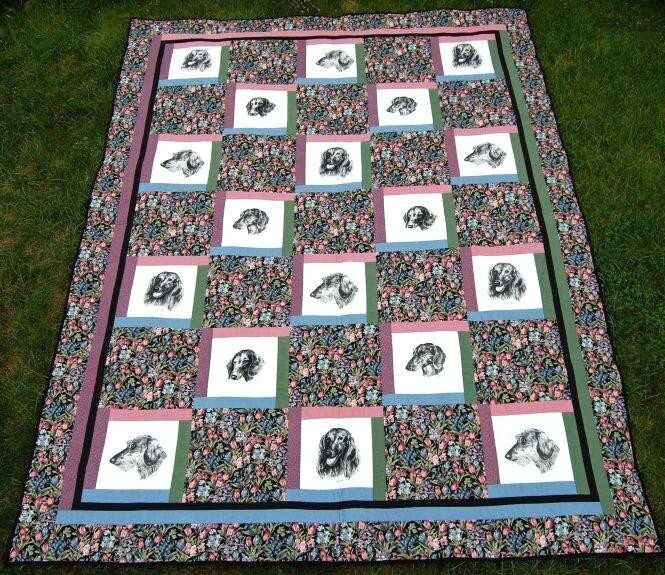 This beautiful handmade queen-sized quilt is being raffled off at Dachshund Rescue of North America. Wouldn't this look great on your bed? 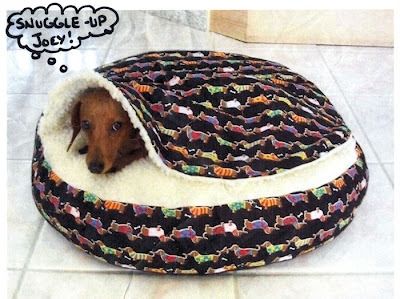 Just gotta keep those pesky real-life Dachshunds off it! Tickets are $5 each or 5 for $20. Winner announced December 19, 2010 - just in time for the holidays. Get your raffle tickets at the DRNA Doxie Store. Thanks to Maria Adams for sending in the link! Apparently over 60 million people play FarmVille on Facebook - guess that's about everyone except us - and maybe you. 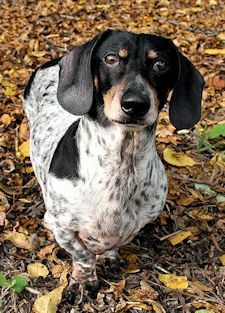 But if you do, you may be excited to know that Dachshunds will soon be available for your farm in cream, black and tan, and red. Excerpt from Games.com: In the near future, FarmVille will be adding an adorable trio of Dachshund puppies to FarmVille's selection of dogs. Dachshunds, wiener dogs, hot dog dogs, sausage dogs, it's all the same lovable companion despite what name you call them by, and soon you can have your very own in FarmVille. Watch where you're pointing that thing Davy Crockett. 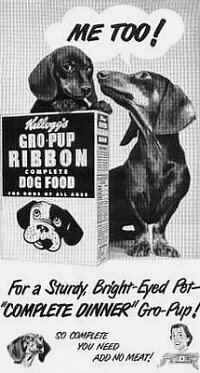 Dachshund History: ANOTHER BLOW TO FRITZ: "DACHSHUND NO GERMAN DOG"
'Whiskey' is the last surviving specimen of a turnspit dog, albeit stuffed. What's a turnspit dog? Find out at Gathering the Jewels, the website for Welsh heritage and culture. 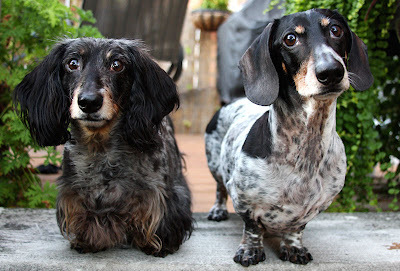 ANOTHER BLOW TO FRITZ: "DACHSHUND NO GERMAN DOG"
What has become of the roly-poly Dachshunds that used to go waddling through our streets looking like some animated form of German sausage? Since the war they have decreased so rapidly that we are in danger of losing one of our most distinct Germanic adornments. That is only a part of the bad news. 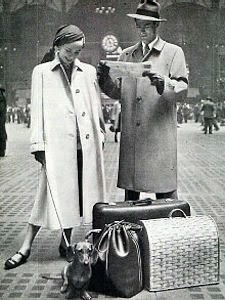 In London it has been said that the Dachshund is not really German at all, but Egyptian instead. This is an age of iconoclasts. We have left ourselves few images, and those are going fast. 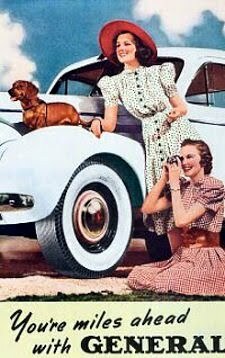 It takes a moment for the mind to accustom itself to the idea that the Dachshund may not be German. Here we have gone along for years calling him Fritz or Heinie when we should have said Amenhotep or Akh-n-aten, if the news from London be true. It must have been an envious mind that originated the idea. Perhaps it was an Englishman's way of revenging himself for the war. But surely it was too great a revenge. Here, at one gesture, we destroy the illusion of the world and break down the pride of a great people. 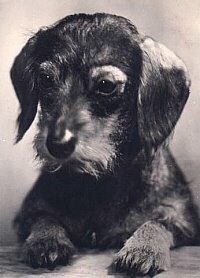 Even the lineage of the Hohenzollerns is not longer nor more august than that of the German Dachshunds. 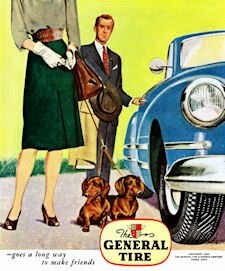 German dog fanciers deny vehemently that the Dachshund is anything but the most Germanic of dogs. They point to his descent from ages past. But the seed of doubt has been planted and the evil blossom has caused investigation. In dusty books it is found that dogs suspiciously like the Dachshund were common in England in the Middle Ages. These were called spithounds or turnspits, and it was their lot in life to go walking around a circle in countless taverns that the spits might be turning just so fast. The poor chaps were trained to the task from their puppyhood. Little to Justify German Claim. 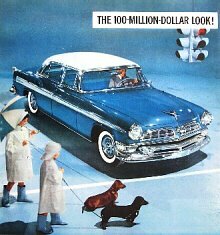 With the progress of science and the introduction of new methods, accompanied by the decadence of cooking and the passing of the old-fashioned open fire for the roasting of meat, the spithound sank into obscurity. Whether he was transplanted to Germany somewhere between the old days and the new is something that even the breeders cannot answer. 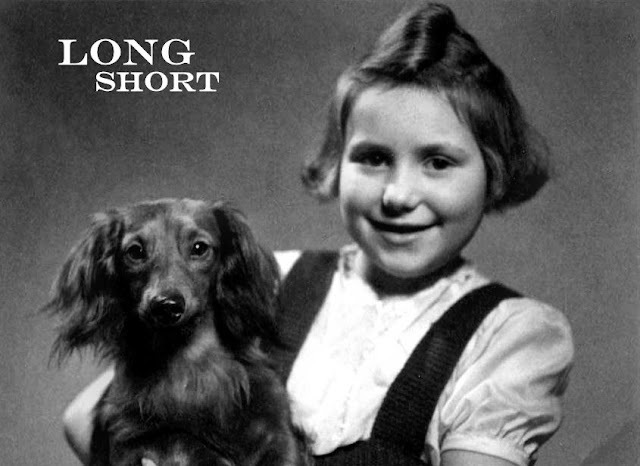 On the other side of the story there is nothing much to justify the claim of a long German lineage for the Dachshund. Men who make it a business to poke about in old books say the German authors of two centuries ago offer no reference to Dachshunds. There the matter stands, with the weight of evidence slightly on the English side. While London and Berlin recently were bringing forth claims and counterclaims as to the origin and rearing of the Dachshund, some of the scholars were hard at work. 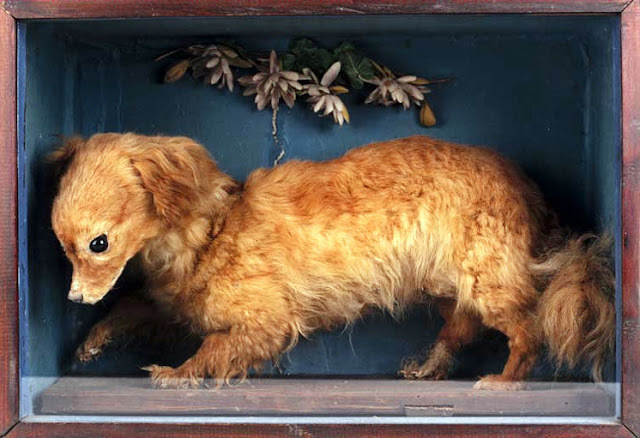 One of them, an Egyptologist, upset the whole controversy by asserting that the Dachshund had been depicted in the Egyptian tombs thousands of years before the Christian era. Both sides paused for a moment to draw breath and turned upon the Egyptologist, demanding his proof. He is now looking for a tomb with a wall inscription carefully marked, "This is a Dachshund." 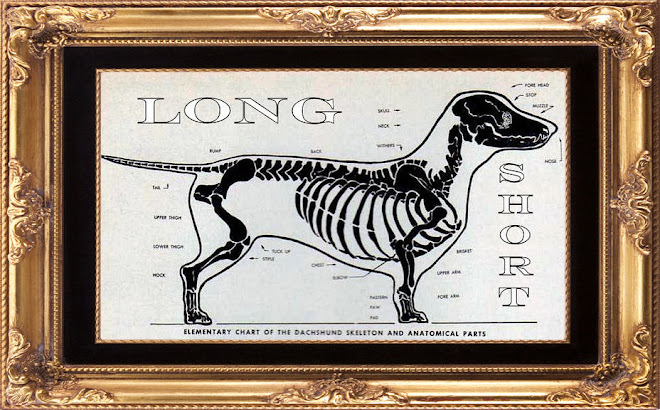 A little inquiry by a layman reveals that a dog much like the Dachshund flourished in Egypt. He had the same long body and short legs. 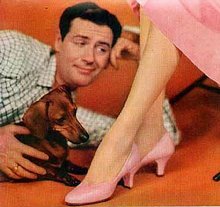 Judging from the only reproduction that can be found in New York, these legs were not so bowed as those of the modern Dachshund. The Egyptians had at least a half-dozen breeds of dogs. One resembled a fox, and another plainly was a hound. 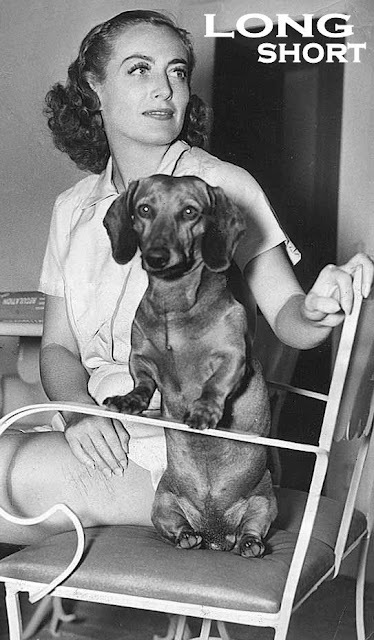 The Dachshund type was not uncommon. It has been found in a number of tombs, particularly in the period of Tehuti-mes, III, who is said to have lent a kindly eye to that ancient Dachshund. The first of the race in this country are said to have come over as long ago as the 60's. They have never been numerous. But up to the war period they were a reasonably familiar sight in the New York streets. 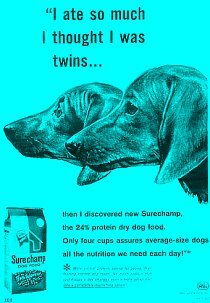 Breeders say that apartment life does not suit them. 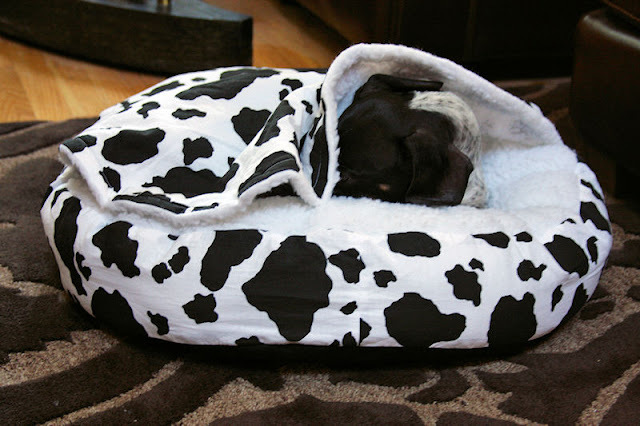 In Germany they are essentially house dogs, but that does not mean being confined all day in a three-and-bath, with only a half hour's walk in the morning and at night, held on a leash, with a wire trap over the nose. 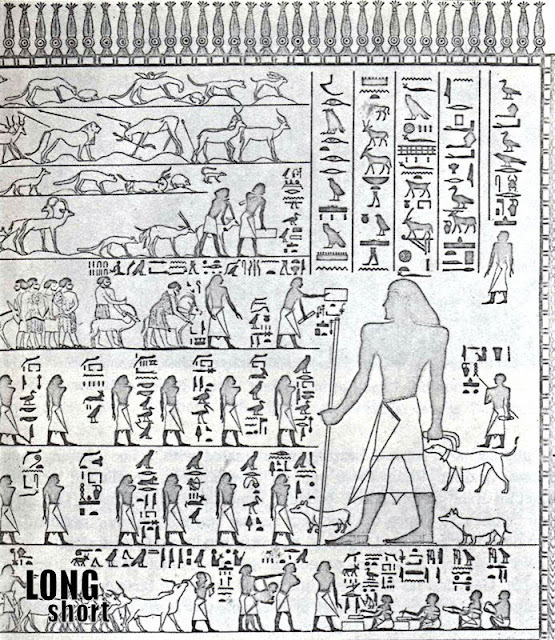 Ancient Egyptian mural of the XIIth Dynasty, app. 2000 B.C. 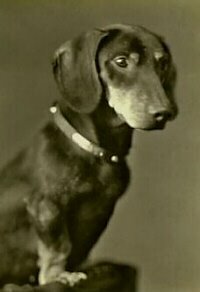 Keep up with the history of the Dachshund at the ever-changing Dachshund wikipedia. Heidi says voting is easy! 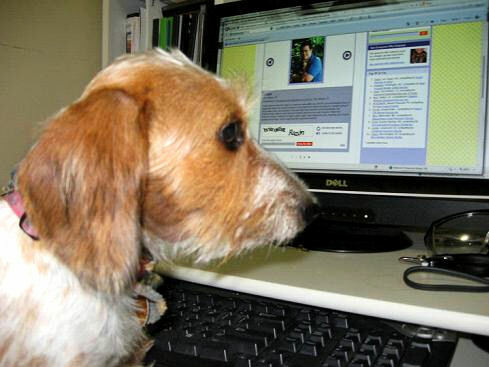 Please vote by going to Petfinder's World's Best Pet Parent Contest. 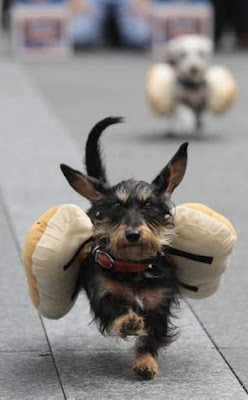 Dozens of Dachshunds dressed as Hot Dogs dashed their way through Fountain Square in Downtown Cincinnati, Ohio on Friday, kicking off the "nation's biggest Oktoberfest celebration," Oktoberfest-Zinzinnati USA. The day couldn't have started worse when 'Charlie,' the two-time defending champion of the annual wiener dog race, bit Fox News reporter Meghan Mongillo in the fingers as she was interviewing him. Maybe Charlie has seen Fox News. Regardless, it wasn't the nicest thing to do and karma got the best of him this year as he was dethroned, and the crown went to pretty red smooth 'Greta!' Way to go girl! In Charlie's defense, it's stated that he is a rescue dog, and is quite protective. His human was very apologetic and offered to pay for any medical bills. The reporter went to an urgent care facility where she got antibiotics, a new bandage, and a tetanus shot. See several really nice photos and read all about this year's event at Cincinnati.com. 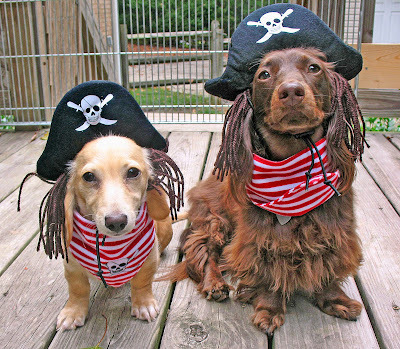 How do Pirates Communicate with Dachshunds? Ahoy there me scurvy dogs! 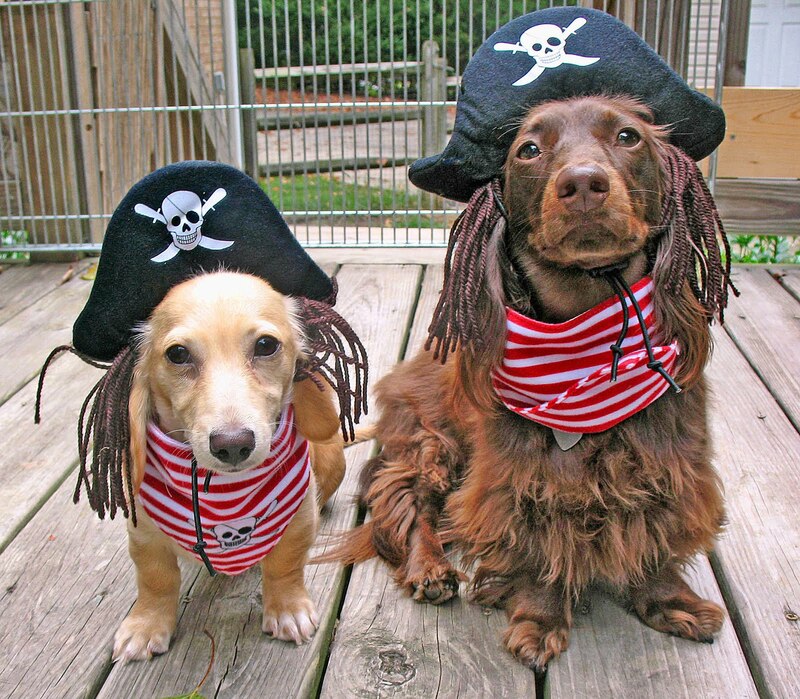 It be a holiday fit fer th' seven seas and if ye landlubbers are not knowin' what we be speakin' of, then ye've not been properly interduced te Talk Like a Pirate Day! This be th' holiday te be celebrated on th' nineteenth o' September and in honor of such a fine day we bring ye these tokens of our love. 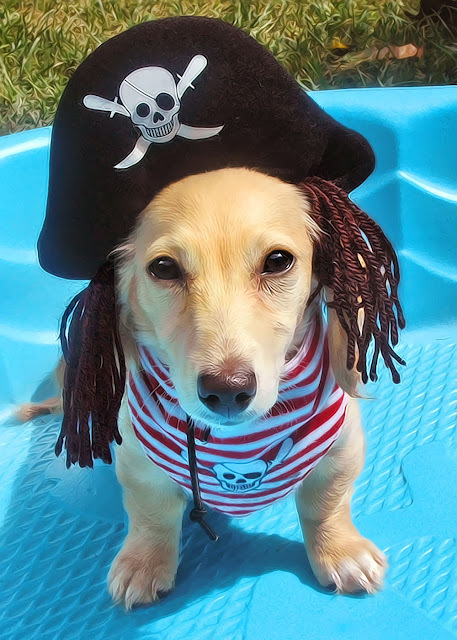 Above, lass 'Honey' will be AAAARRRRrffffin all tide in her swashbuckler outift, an' below she be joined by laddie `Teddy` on th' poop deck! Aye, much thanks to Doxieone for th' photos! 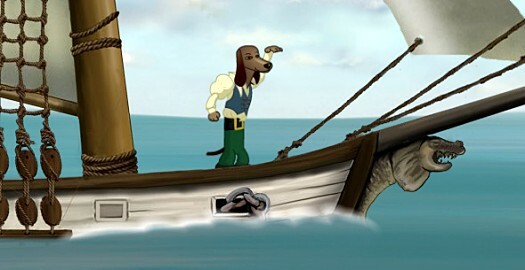 And if gamin' be yer thing, be sure an' check ou' th' new pirate video game which came out ealier this year: Jolly Rover. It stars a Dachshund named Gaius James Rover, an "anthropomorphized foppish pup" wi' a taste fer tea. James tookst a wrong tack somewhere in th' ocean o' life an' ended up as an ineffective, overly polite pirate instead o' th' world-renowned circus clown he be destined te be. James’ sweet naïveté isn’t a very good fit fer th' life o' a pirate an' lands th' lad's in a variety o' scrapes throughout th' course o' th' game. 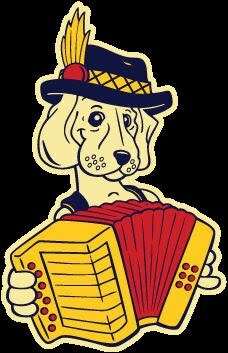 We've featured 4 other Dinah the Dachshund cartoons over the years, but they've all been taken down from youtube. There are several back up at the moment though. 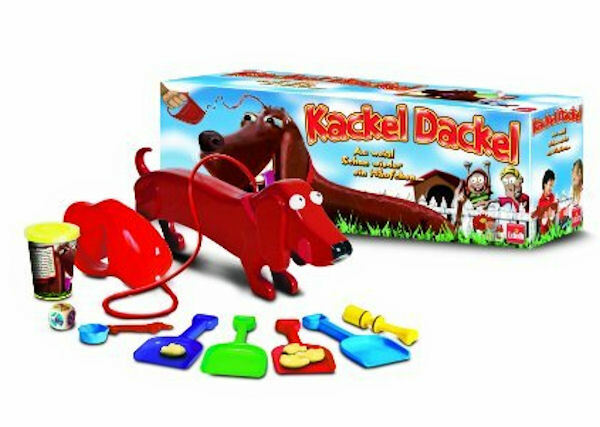 Here's the perfect gift from crazy Dachshund-loving Aunt Marge to give to all her nieces and nephews for the holidays this year: Kackel Dackel, the game that teaches kids the importance of cleaning up after their dogs when they go potty. Made by game company Goliath in the Netherlands, here's info loosely translated from Amazon Germany: The Kackel Dachshund is always hungry! Throw the dice to see if you feed him or take him for walkies. Oops ...! What has happened now? Kackel Dachshund has put a heap on the road! This is not good, because dogs can not simply do their business everywhere. Collect the pile with your shovel, and fill your bucket. The first player to fill their bucket to the brim is the winner. From 4 years for 2 - 4 players. We're sure that you remember handsome red smooth 'Lance,' the Florida therapy Dachshund on a mission to brighten the days of the patients at Miami's Children's Hospital. Lo and Behold, The Associated Press has recently done this Video Essay on Lance! They note: when their 6-year-old dachshund became paralyzed, Caio Stinchi and Claudia Machado had a specialized wheelchair made. Now little Lance has become "Super Lance", a therapy dog visiting sick children in Miami. Keep up with Lance at his super website. Mindy Brucker imparts a few encouraging words to her Dachshund, 'Marley,' at the starting line of The Running of the Weenies contest at the 39th annual Germantown Festival on Sunday in Germantown, Tennessee near Memphis. 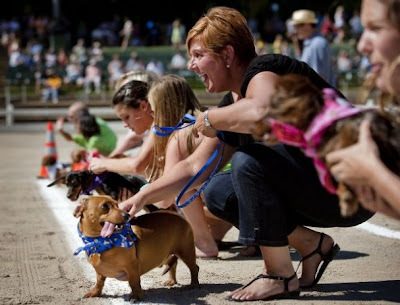 According the The Commercial Appeal, defending weenie race champion 'Tux' took top honors again, leaving all other dogs in the dust in his preliminary heat and a final championship round. The USA-flag-clad Dachshund's prize winnings will go to the Collierville Animal Shelter. Way to go Tux! Read all about the event at The Commercial Appeal. 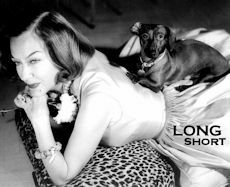 Just when you think you've seen all the possible major players in Popular Culture with a Dachshund, a kind Dachshundist sends in a new gem. Yep, it's Marilyn Monroe. Who? We think you know. Marilyn Monroe (June 1, 1926 – August 5, 1962), born Norma Jeane Mortenson, but baptized Norma Jeane Baker, was an American actress, singer and model. Her early film appearances were minor, but her performances in The Asphalt Jungle and All About Eve (both 1950) were well received. By 1953, Monroe had progressed to leading roles. Her "dumb blonde" persona was used to comedic effect in such films as Gentlemen Prefer Blondes (1953), How to Marry a Millionaire (1953) and The Seven Year Itch (1955). Limited by typecasting, Monroe studied at the Actors Studio to broaden her range, and her dramatic performance in Bus Stop (1956) was hailed by critics. Her production company, Marilyn Monroe Productions, released The Prince and the Showgirl (1957), for which she received a BAFTA Award nomination, and she received a Golden Globe Award for her performance in Some Like It Hot (1959). 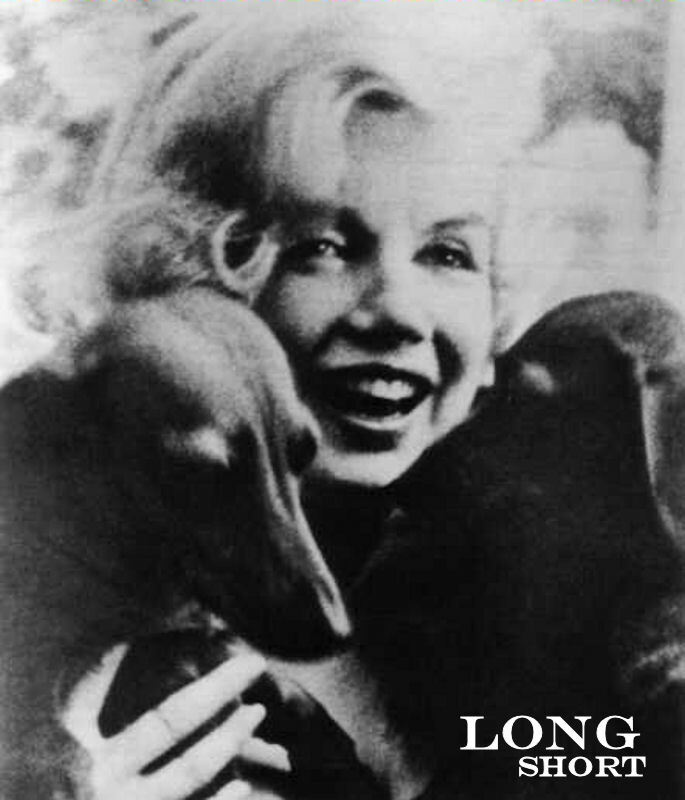 The final years of Monroe's life were marked by illness, personal problems, and a reputation for being unreliable and difficult to work with. The circumstances of her death, from an overdose of barbiturates, have been the subject of conjecture. Though officially classified as a "probable suicide," the possibility of an accidental overdose, as well as the possibility of homicide, have not been ruled out. In 1999, Monroe was ranked as the sixth greatest female star of all time by the American Film Institute. 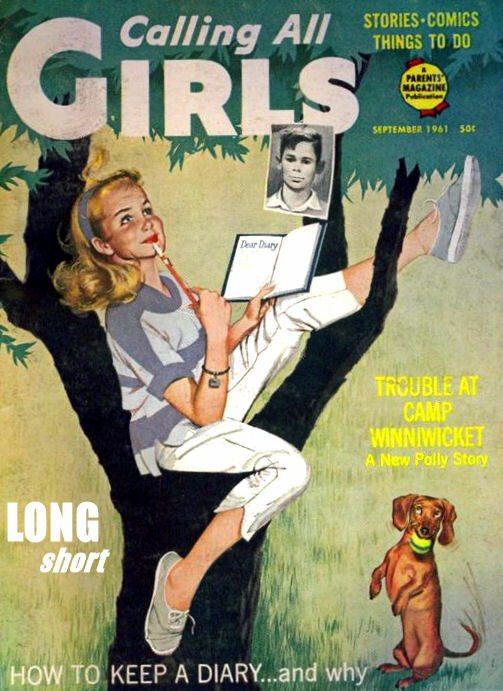 In the years and decades following her death, Monroe has often been cited as a pop and cultural icon. Source. Firstly, can't tell you how happy we (me, Paul & doxies Louie and Milo) are to read about Joey's continued progress .. 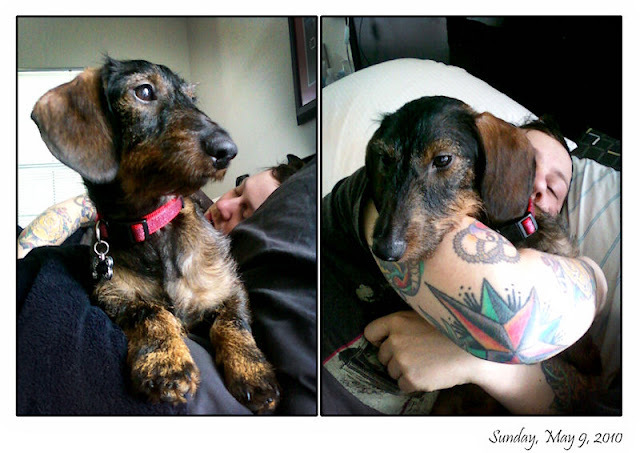 I read the blog out every day to keep the whole pack informed on how the little man is doing. 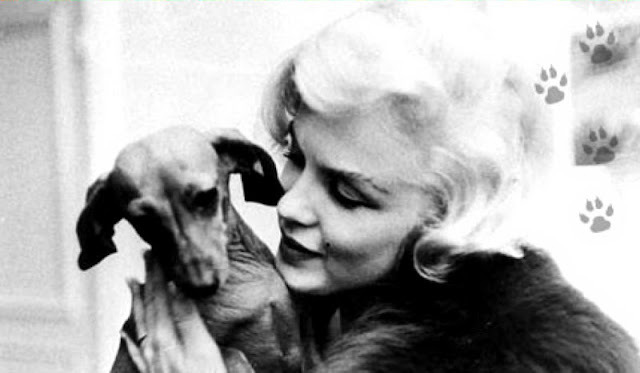 I have attached some very lovely photos of Marilyn .. Marilyn never owned a dachshund herself, but she adored all animals and owned a basset hound named Hugo and later, a Maltese called Maf. In March 1959 Marilyn was awarded the French Crystal Star for best Foreign Actress (for The Prince and the Showgirl). 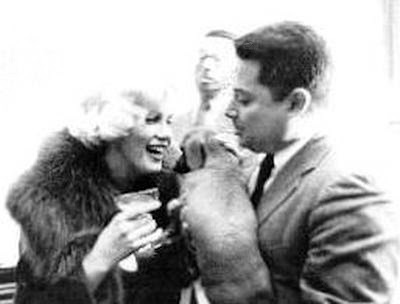 She accepted the award at the French Ambassador's home, and was enchanted by his two Dachshunds. 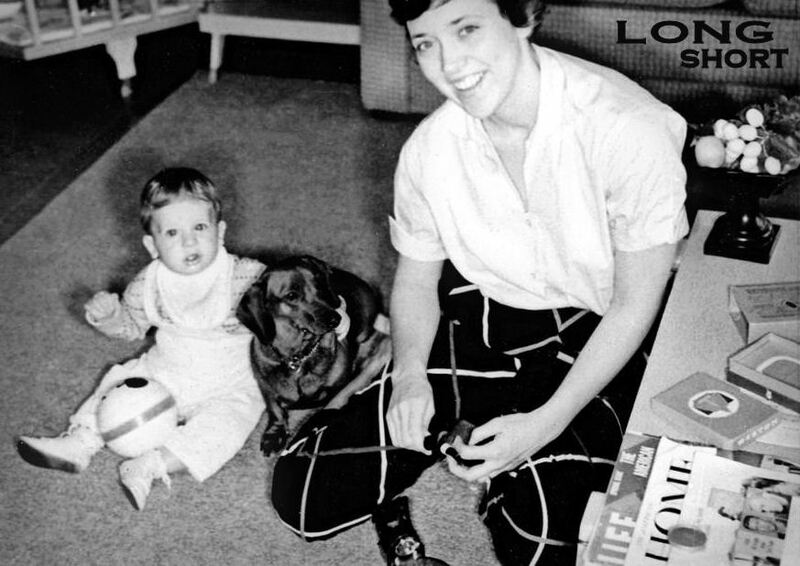 Indeed, she spent a great deal of time cuddling and fussing over these little dogs, and some really lovely pictures were captured. Sir Elton John honored Marilyn Monroe with 1973's Candle in the Wind. Joey continues to recover very well following his recent surgery and the complications which ensued. Today was his follow-up visit with his Internist, as it has been nearly 2 weeks since he was discharged from the doggy ICU, and he was due for his second monthly shot of DOCP, a drug which he must now have for the rest of his life because he doesn't have any adrenal glands. When we walked into the Veterinary Referral Center for the 1 PM appointment, all the ladies behind the front desk got excited - "JOEY!! Joey's here!" They filed out one by one to get on the ground and greet him, and he responded with lots of tail wags. One cute gal said to Dad "Did you get your phone reminder about Joey's appointment? That was me yelling in the background at the top of my lungs that Joey was coming to visit!" We were ushered into an examination room like VIP's when the veterinarian's assistant came in and said "I saw Joey's name on the list today and told the doctor that I get to be the person to take his case. I had to see my Joey again, I missed him!" She carried him away to get his weight, and also took him for a short visit to all his friends in the ICU before coming back to the exam room. He weighs 20 pounds now, up two pounds since he was discharged. His normal weight is 22 or 23 pounds. His Internist, Dr. Mordecai, came in the room, all smiles to see Joey looking so well. Joey hid behind Dad's legs and didn't really want to come out from behind them to see the doctor. Another vet tech came in the room to say hello, and Joey tried to escape out the door. "Not again, they're not keeping me this time," he must have thought. The good doctor sat on the floor with us to examine Joey which made him feel a little more comfortable. He got his last dose of Plavix this morning, the anti-platelet medication he was on for his pulmonary embolism. It wasn't used to really treat the PE, but to prevent any other clots from lodging onto it if they were to break loose from either his incision or where his central catheter was placed in his jugular. The vet also discussed an oral medication instead of the DOCP shot for his Addison's Disease, but the vet warned "if you were to miss a dose, you'd really be in trouble." Dad chose to keep him on the shot until things are a little more under control and to think about the oral medication later. So, he got his second DOCP shot. He will require electrolyte monitoring in 11 days, and again when it is time for the next shot so the dosage can be titrated if necessary. Essentially the shot regulates the amount of potassium and sodium electrolytes in Joey's system, and based on those levels, the drug is titrated up or down. Dad also asked about the daily prednisone and the risk of ulcers - should Joey be on Pepcid or something for his stomach? The vet didn't think so - the prednisone is supplying what the adrenal glands would normally produce, so it shouldn't be an issue. Then Dad asked about the surgery-induced pancreatitis - is pancreatitis going to be a lifelong problem for Joey? Again, the vet didn't think so - "We know that the surgery caused the pancreatitis, he should be able to go back on his normal diet in a month or so." Dr. Mordecai carried Joey out to draw some blood to check his electrolytes. As the door closed, Joey's eyes stared intently at Dad as if to say "please don't leave me here again." Poor fella. All of his labs came back normal, with a lower sodium and higher potassium - still within normal ranges, but these values are expected with an Addisonian Dog. The good doctor doesn't want to see Joey again until December so that he can get an ultrasound and see how his "gallbladder sludge" is doing, and to see if the ursodiol he is taking is helping to reduce it. His DOCP shots and titration can take place with his regular vet. And with that, we were off to the exit - Joey prancing through the halls of the hospital as if he owned the place - head held high and tail wagging hard - much to the delight of the visitors and staff. Dad was proud of his handsome boy. You know you're having a great day when you come home and find a package on your doorstep. 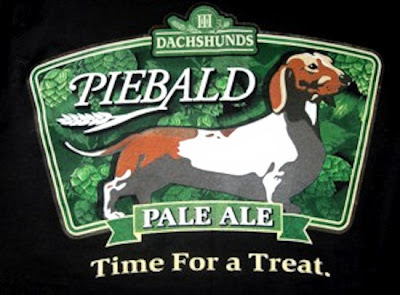 It gets even better when you open it up and find a super cool Piebald Pale Ale t-shirt from III Dachshunds Beer Company inside! While we can't decipher who the package was from, we've got a pretty good idea. Thanks! Unfortunately Dad didn't have any Piebald Pale Ales stocked in the fridge to go with the t-shirt, but he said the III Dachshunds Root Beer he usually has around was "pretty darned tasty." September can only mean one thing: that's right, our favorite month of the year, Dachtober, is right around the corner! I hope all is well in Chicago. It is brutally hot here in KC, so everyone is staying inside (or in a pool!) as much as possible. I came across this today as I was looking for some prints for my house. I may not be able to pass this one up . . . I hope Joey is feeling better! That video title pretty much sums it up! The Parade of Power is put on by Rough & Tumble, an Engineer's Historical Association in Kinzers, Pennsylvania. 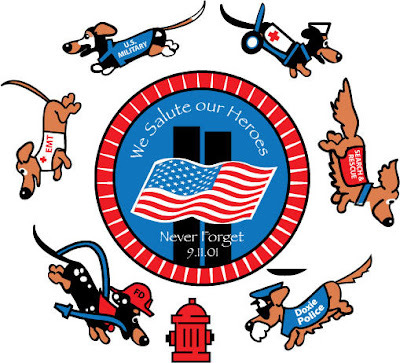 Within hours of the September 11, 2001, attack on the World Trade Center, specially trained dogs were on the scene, including German Shepherds, Labs, and even a few little Dachshunds. Source: 99 Fun Facts About Dogs. 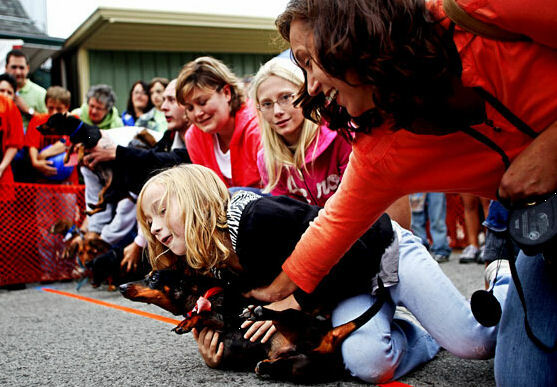 Tomorrow is DRNA's 14th annual Midwest Dachshund Festival at the Vermilion County Fairgrounds off U.S. Route 150 near Danville, Illinois. We won't be attending this year with Joey recovering from surgery, but hope that everyone has a great time! Above is this year's patriotic t-shirt design. Read all about the festival at the Commercial News, or the official MWDF site. There will be 17 vendors this year including Midwest Dachshund Rescue and Dachshund Delights, who is also sponsoring this year's event. Dodgerslist, your IVDD resource, started this annual event 14 years ago. Speaking of Dachshund Delights, we are honored that your 'Long and Short of it All' host 'Joey' is featured in this month's newsletter and that 'Maggie' is Dachshund of the Month! Joey continues to recover very well. His appetite continues to improve, and he has not vomited since last Sunday morning. He is off his anti-nauseants and has been started on ursodiol for his "gallbladder sludge." He has an appointment next week for his second monthly DOCP injection for Addison's Disease, and his 2-week post-surgery follow-up. Plavix 75 mg - 1/2 tablet orally once daily for 10 days. This medication helps prevent blood clots from forming. Amoxicillin 100 mg - 2 tablets orally three times daily for 14 days. This antibiotic has been stopped for good due to nausea. Metronidazole 250 mg - 1/2 tablet orally twice daily for 4 days. This medication for diarrhea has been stopped because his stools were well formed, and it was possibly causing nausea. Ursodiol 100 mg capsules - 1 capsule orally once daily with food. 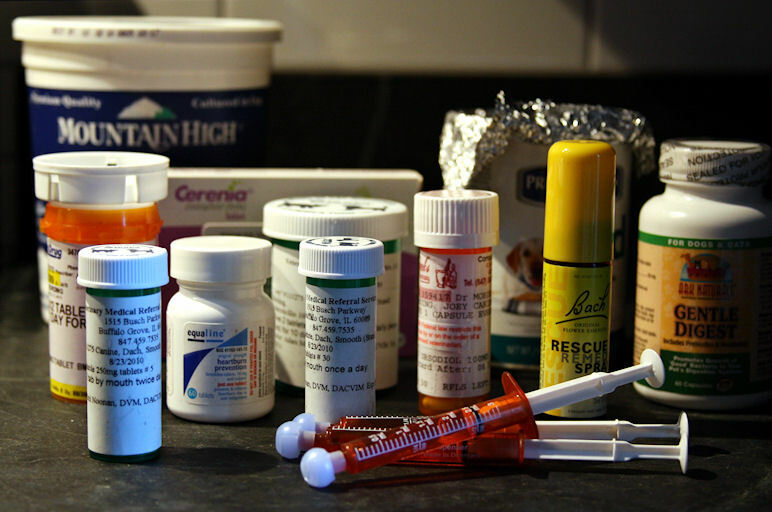 This medication for "gallbladder sludge" has not yet been started because it causes nausea. Will be started soon. Prednisone 5 mg - 1/4 tablet orally once daily for life. Famotidine (Pepcid) 10 mg - 1/2 tablet every 12 hours to help with prevent stomach upset. This was added a day or so after he came home because of continuing nausea. Metoclopramide (Reglan) oral liquid (seen in amber oral syringes above) - 2.5 mg/2.5 mL every 8 hours. This was added to his regimen on Friday because of nausea. Cerenia 24 mg - 1 tablet orally daily for 4 days. We asked the vet to give us this stronger anti-nauseant on Friday in case things got worse over the long holiday weekend. Luckily, things have continued to improve, and vomiting didn't get "out of control" for us, so he didn't get any doses. This medication can't be given for long periods of time, and he was getting this in the hospital, so we were just saving it in case of emergency. 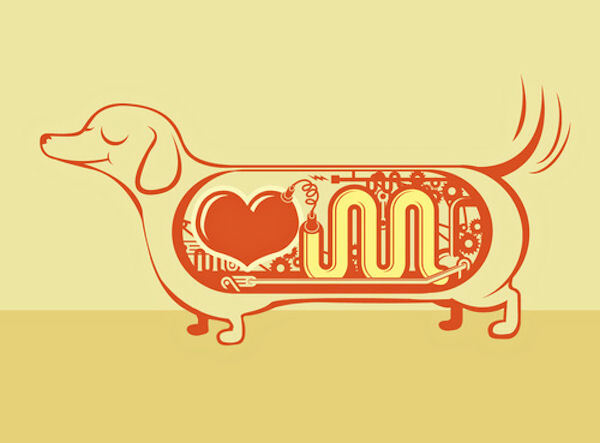 Probiotics - We asked the vet if we could give him this to kick-start his intestinal flora. He agreed that we could. Rescue Remedy - one of our herbal friends suggested that we spray a little of this inside his ears to promote well-being. He runs to hide when the bottle comes out! It doesn't get sprayed IN his ears, but just on the inside flaps. Thanks for all the tips on getting the pills down him. We can't use peanut butter or anything fatty because of his pancreatitis. We tried the pill pockets, but they didn't work either because he chews everything and found the pills and spit them out. He's starting to swallow larger pieces of food now though, so if we coat the pills with canned dog food, we're getting him to swallow them. Finally. 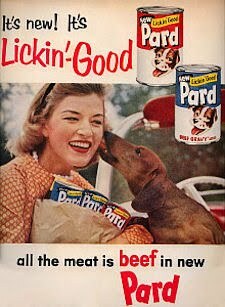 Joey is getting different types of canned dog food that came home with him from the hospital. He eats every 4 -6 hours. Evanger's, ID, and the newest is WD. Never in a million years did we think we would offer him food that contained corn and peanut hulls, but it is low fat and fills him up. He is getting to the point that we may switch him to a low-fat kibble - and we're sure he'll hate it. The internal med vet doesn't want him back on raw - he doesn't like the raw diet (no surprise there) - but he says we can start him back on it in a month or two "if we so desire." We also make chicken and rice, or ground chuck (96% lean, cooked and then blotted with a paper towel) and rice for him. We add fat-free yogurt to his food as well for intestinal flora support. Joey and Maggie went on 20 - 30 minute walks every day over the holiday weekend. We went to the park where he could walk off-leash at his own pace. Maggie is the one who isn't really up for the walks! Joey enjoyed the fresh air, and also spends a lot of time on the deck sunning himself. Overall, Joey is doing very well. His vomiting episodes are becoming less and less frequent - not sure if it's the metoclopramide which is finally helping, but it seems to be mostly bile that he is vomiting. He gets pieces of low fat wheat bread several times a day between meals to help soak up the bile. He hasn't vomited now since 5 AM on Sunday morning, so things are looking up in that regard. He's happy and fairly active, although he understandably likes long naps, but then don't we all? Maggie is jealous of all the food and snacks that Joey is getting all the time, but we give her little bites of his food so she doesn't feel completely left out. She's happy to have her brother home. Please accept our humblest apologies for not updating the past few days - it's been a whirlwind of activity. 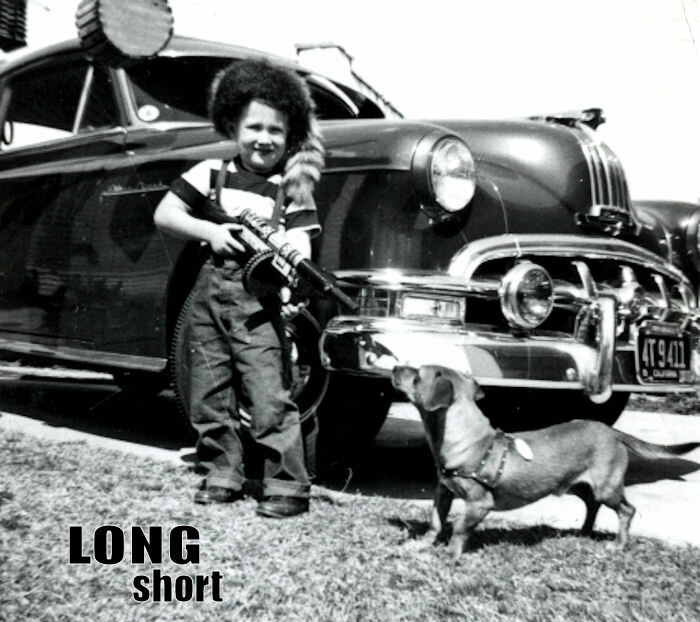 A lot of folks have been worried, but the good news is that your 'Long and Short of it All' host 'Joey' is indeed home! He came home on Wednesday afternoon to much fanfare. While Dad's friend picked him up at the hospital, a lot of the hospital staff came out to the lobby to wish him a fond farewell. Dad left work early to meet his friend at her house where Maggie was also staying for the week. Joey was sure excited to see his Dachshund friends, and also his sister. Maggie and Joey seemed a little indifferent at first, but it didn't take too long for them to lay down together and to clean each other's ears and faces. Hope to get some photos of Joey and Maggie together soon. Joey is still a pretty sick boy, and he's on a lot of medications. He's on Plavix once a day for his blood clot in his lungs; amoxicillin as an antibiotic; metronidazole for diarrhea; a small dose of prednisone for life; ursodiol for his gallbladder sludge (3-4 months), and will be due for his DOCP injection in a few weeks (a shot for his Addison's disease, which he will get the rest of his life). He also gets a hot pack to his jugular twice a day where his central catheter was. All of his stitches have been removed. The skinny boy is eating small amounts of canned food every 4 hours around the clock. We take one tablespoon each of two different types of food and mix them together in little meatballs for him. He seems hungry, and has an interest in food, but he chews the food slowly, spits a little out, and sometimes doesn't eat it all. He vomited the first evening he came home at about 7:30 PM, and again at 2:30 AM and 4:30 AM (Thursday morning). We called the vet about this, and have withheld his amoxicillin and ursodiol because they make him nauseous. We asked the vet if we could add Pepcid and some probiotics to his list of meds, and he agreed. Joey didn't vomit yesterday morning and afternoon, but he did vomit again in the evening at 7 and 9 PM, and this was without receiving the amoxicillin and ursodiol. He got some plain cooked chicken breast about 1 AM this morning, and has not been sick. His stools are nicely formed. He remains somewhat bright and alert even with the nausea. It's a challenge to pill this boy now. It has always been fairly easy to give him any pills in the past: stick it in a piece of cheese, and he gulps it down. But now that he is chewing his food, he finds the pills and spits them out. Even if you stick the pill in the back of his throat, he has developed this gag reflex where it instantly pops back out again before the hand you used to put it in his mouth even has time to close his snout and caress his throat. The little devil! We will be talking to the vet today to see about how we can put him back on the amoxicillin and ursodiol with his continuing nausea. So that's where we are this morning. 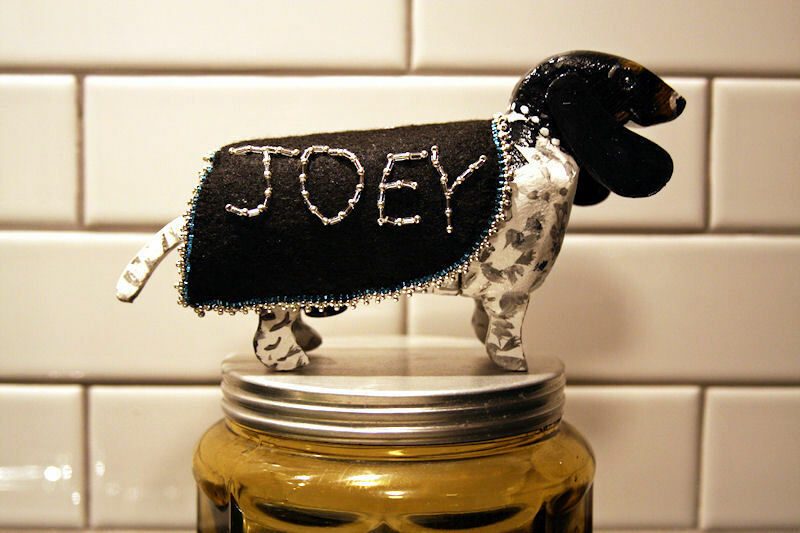 And Joey hasn't been shrunken and turned into a cute wooden artifact, as seen in the photo above. It's a gift from Honey, Teddy, and Chili! Thanks! It sure did brighten our day when we got it late last week. Cool, right? And thanks again so much for the comments and emails - they are a lot easier to read to Joey now that he is home.